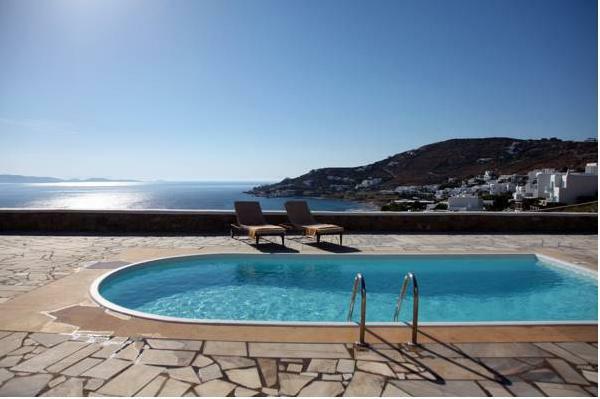 Located in Agios Ioannis of Mykonos, Horizon Mykonos offers uniquely decorated villas with private pools and panoramic views over the Aegean Sea. Guests enjoy free WiFi in all areas and free 2-way transfer from the airport. The spacious, air-conditioned villas of Horizon Mykonos are fitted with beamed ceilings, well-chosen furnishings and rich fabrics. Each features a living room and a fully-equipped kitchen with stove and microwave. Air conditioning, a safe and an LCD satellite TV are available. The marble bathrooms are stocked with free toiletries and hairdryer. Guests can use the swimming pools, the bar and the other facilities of the sister property located within a short walk from Horizon Mykonos. Staff at the 24-hour desk can help with car rental, can provide information on the island and can arrange table reservations. Guest relations and babysitting services are also provided upon request. Horizon Mykonos lies within 4 km from Mykonos International Airport and 6 km from the new port of Mykonos. The lively main town, with its variety of restaurants and bars, is 4 km away. Free parking is possible on site. Είστε ιδιοκτήτης ή διευθυντής στο HORIZON VILLAS; Εγγραφείτε τώρα για δωρεάν εργαλεία, που μπορείτε να χρησιμοποιήσετε για να βελτιώσετε την καταχώρησή σας και να συνδέσετε την ιστοσελίδα σας και το σύστημα κρατήσεών σας.